Our Busy Bees Fours Classroom is designed for children 3 years old by September 1 and who will turn 4 years by August 31 of the following year. The student to teacher ratio does not exceed 10 children to 2 teachers. The class attends chapel with the St. Mark Pastor every Tuesday morning. Then throughout the year special field trips are planned to enrich learning. While continuing to define the skills they learned as Butterflies and Birds, these almost-four-year-olds are becoming more self-reliant. They can dress themselves and have achieved potty training with few or no accidents. They begin to make decisions and follow directions. They enjoy playing with others and are able to solve simple conflicts on their own. Four-year-olds are observant of the world around them with a fine attention to detail. They also strive to get things right and like to learn. From an educational perspective, teachers begin to focus on fine motor mastery by helping students hold writing tools properly. Teachers provide activities to learn the alphabet and count to higher numbers with success. 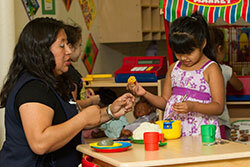 Dress-up clothes and life-like toys are provided, as children’s dramatic play becomes astonishingly “real”. In this class, we focus on the developing process of learning many skills, and not the finished product. These building blocks are the indicators of success in their Pre-K year. Teachers invest time in helping each child identify their emotions and express them appropriately. We also see separation anxiety cease as children become secure in familiar environments.